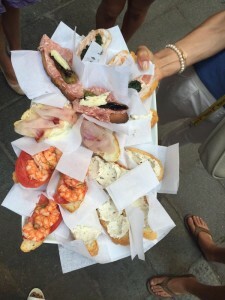 On my birthday, with 24 hours to spend in Venice, I did what any foodie would do: I scheduled a food tour. What better way to usher in a new year than an afternoon spent nibbling on fresh Venetian fare? Venice, a group of 118 islands with approximately 56,000 residents in total, is home to many culinary inventions: the bellini, white peach puree mixed with prosecco, which was invented at Harry’s Bar; Aperol Spritz, the most commonly drunk aperitif in Italy; and carpaccio, thinly-sliced raw beef, named for the 15th-century Venetian painter Vittore Carpaccio. Our first stop was Al Mercà, a wine bar where we indulged in prosecco and some cicchetti (Italian tapas) including traditional baccalà mantecato (a creamy salted cod pate). 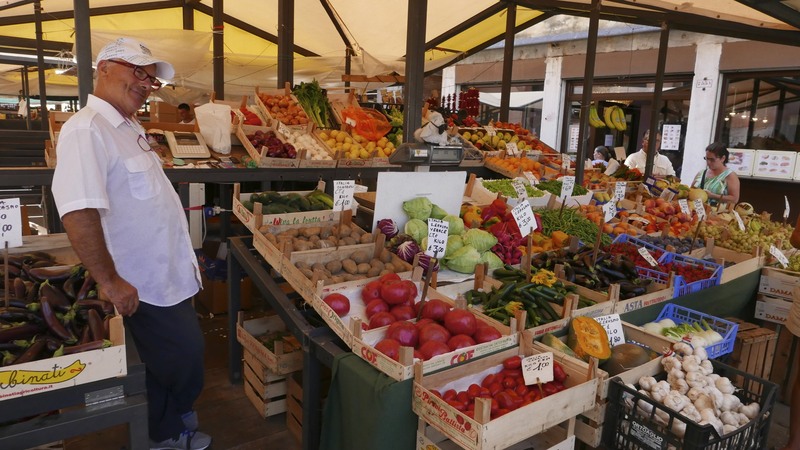 Locals and tourists wandered through the vibrant Sant’Erasmo market, which had possibly the sweetest plum tomatoes I’ve ever tasted. “Now you won’t see any asparagus—we have seasons,” our guide, Kristina, explained, noting the absence of some vegetables. “Local” and “seasonal” might be a relatively new way of eating for Americans, who are used to buying tomatoes in winter regardless of whether they reside in Minnesota or Manhattan. But in Italy, residents have been eating with the seasons for centuries. Kristina also introduced us to some Venetian foods I’d never encountered, including saltimbocca (veal topped with prosciutto and sage or basil, marinated in wine)—which translates as “It jumps into your mouth.” The dishes we sampled—from fried zucchini flowers with creamy salted cod to fried calamari to polpettone (meatballs) with polenta—had no trouble jumping into my mouth.